The Kansas City Chiefs defended Arrowhead Stadium with a 29-19 victory over the Denver Broncos. 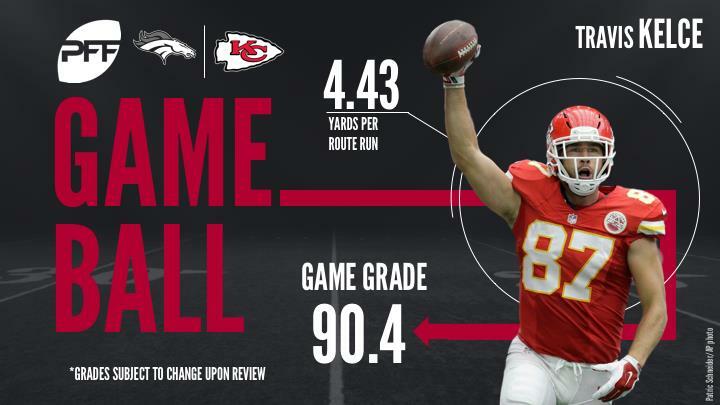 TE Travis Kelce was the only Chiefs offensive player to have a big statistical day, as he had 133 yards and a touchdown on seven catches. The Chiefs defense put up as many touchdowns as their offense on the night, as CB Marcus Peters forced and returned a fumble for a touchdown early in the first quarter. The Broncos passing attack was out of sync, as QB Trevor Siemian threw three interceptions and averaged only 5.5 yards per attempt. Their bevy of running backs had success running the ball, running for 157 combined yards, though Jamaal Charles did lose the fumble that allowed Kansas City to score. Travis Kelce was by far the best player on Kansas City’s offense on a night where the unit wasn’t clicking like in weeks past. He ended with a season high 133 receiving yards on 10 targets, with 50 of those yards coming after the catch. Kelce worked against a variety of Broncos defenders as he caught passes against six different players. Going up against one of the best defenses in the NFL, there wasn’t much available downfield for Alex Smith and he had to make quick decisions in the pocket with the ferocious Denver pass-rush opposite him. Smith wasn’t very effective under pressure tonight like he has been early in the season, as he completed only 3-of-10 passes for only 33 yards. Smith did find success at the intermediate level, completing 5 of his 8 passes that traveled between 10 and 19 yards through the air for 107 yards. Peters was targeted four times in coverage on Monday night, surrendering two catches for a total of just 12 yards to go with a (relatively easy) first quarter interception. Siemien had just a 16.7 passer rating when targeting Peters’ coverage for the night. Peters’ highest-impact moment, however, came just 15 plays into the night, when he not only stripped Jamaal Charles of the football but then proceeded to scoop it up and take it to the house to give Kansas City the early advantage. Johnson did accumulate three stops on the night but he had his struggles in both run defense and in coverage. Johnson vacated his coverage and left Bennie Fowler open for a should-have-been touchdown mid way through the third quarter that Fowler dropped. He was also sealed out of running lanes at the second level throughout the game. By nearly all measures this was a poor showing from the Broncos’ quarterback. Siemien had a disastrous night when pressured, completing 0-of-6 passes while throwing two picks (including an inexcusable one where he attempted to find Demaryius Thomas but threw across his body over the middle of the field). He attempted 17 passes on the night that traveled at least 10 yards in the air and he connected with his receiver just six times for a total of 79 yards; all three of his interceptions came on balls that traveled at least 10 yards in the air. Wasn’t a stellar night for Bolles in pass protection, where he earned a 75.6 grade after allowing three pressures (two hurries and a hit) on 41 pass-blocking snaps. Bolles did, though, once again show off his run-blocking prowess, putting up a great 86.9 run-blocking grade that lead the offense. The Chiefs did a nice job limiting Von Miller to a minimal impact in the first half but in the second he found ways to effect the run game and flushed Alex Smith out of the pocket on some occasions. Miller finished with six total pressures on his way to a pass-rush grade of 81.4 and, like most elite pass rushers, he played the run well too on his way to three stops and a grade of 87.0. The six pressures added tonight brings Millers season total to 41 through seven games. Linebacker Brandon Marshall has had an up and down season through seven games but played well Monday night. He contributed four stops in the run game as the Kansas City offensive line had a tough time sealing him at the second level. Apart from the dropped touchdown pass by the Chiefs’ Demetrius Harris, Marshall was decent in coverage, surrendering only two catches on four targets for 8 yards.